Bryans 3-Ball Allwins, Forks, etc. 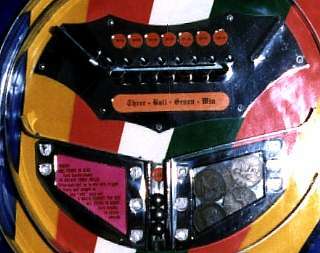 In 1961 Bryans invented his 3-ball mechanism, which was used in three similar games: The 3-Ball Seven Win, the 3-Ball Nine Cup, and the 3-Ball Forks. These machines had a winding handle to operate the mechanism, instead of the usual payout knob. The player was provided with 3 balls which he would shoot around the playfield in the usual manner. 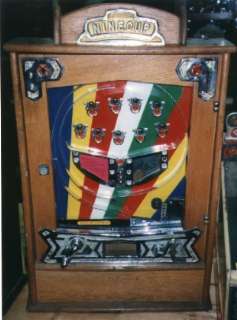 The machine would pay out 2 coins for each winning ball (although this could be varied). 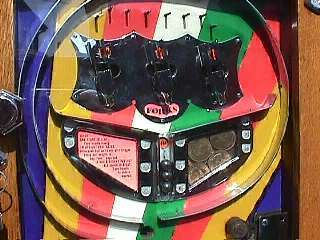 If all three balls were winners, the player would also win the contents of the jackpot in the centre of the playfield. The Forks was slightly more sophisticated, as it was provided with a ball catching feature. The three winning holes were covered by three chrome 'forks' which could be swung to and fro by the player, in an attempt to catch the ball as it fell. These were controlled by the knob seen halfway up the cabinet on the left-hand side. 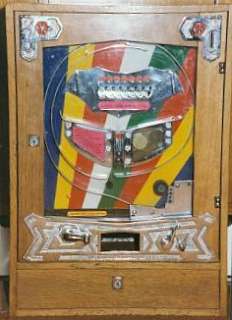 The 3-Ball Allwins were available in a number of different case styles. 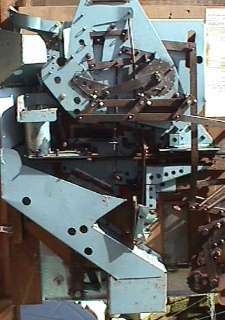 View showing the complex mechanism of the 3-Ball Allwins. This one is from the Forks. 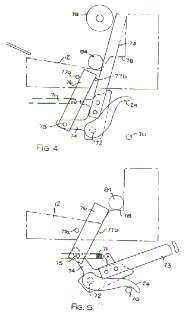 Part of Bryan's patent specification for the Forks. 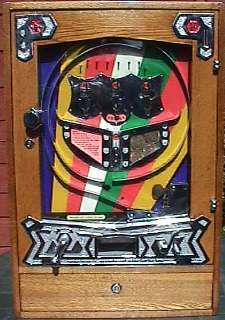 A particularly interesting feature of these machines is the method by which Bryan fed the three balls in turn to the trigger mechanism. 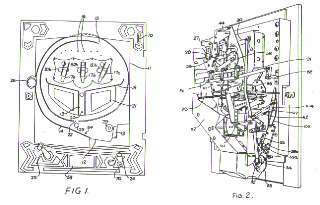 Instead of having a complicated feeding mechanism to release one ball at a time from the machine; Bryan released all the balls at the start of play, but arranged for them to fall below the level of the hammer. As the hammer is pulled back by the player, a simple 'L' shaped lever lifts up each ball in turn and deposits it on a ledge at the firing position. A delightfully simple solution to avoid the need for a complex internal feeding mechanism, and a typical example of Bryan's ingenuity.